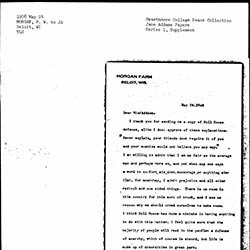 Subject is exactly "Hull-House, criticism of"
"M. McG." 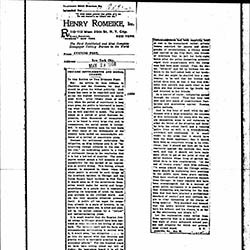 criticizes Hull-House for turning into a capitalist tool and expresses hope that it will find its way back to its early successes. 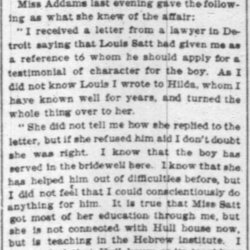 Addams weighs in on the sentencing of Louis Satt, the brother of a Hull-House student. 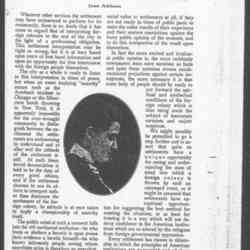 B. F. writes in praise of Addams' article "The Chicago Settlements and Social Unrest" in Charity and the Commons, discussing the role of the settlement in integrating immigrants into city life. 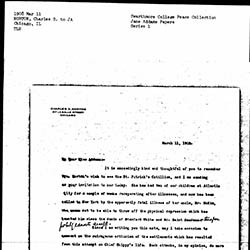 Morgan chastises Addams for taking a strong position on the Averbuch Incident because it could bring undue harm to Hull House. Addams discusses the association in the public eye between settlements and immigrants and when immigrants are involved in high profile crimes, settlements are accused of supporting anarchism. Addams defends the role of the settlement as the bridge between immigrant communities and the American public, holding that it does not change in times of crisis. 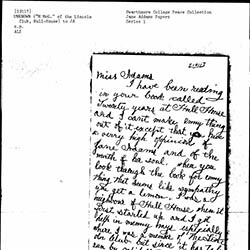 Norton updates Addams on his family and offers his sympathy for the negative attacks on Hull-House printed in the newspaper following the murder of Lazarus Averbuch. 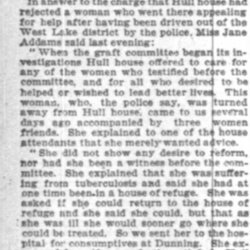 Addams denies an accusation that Hull-House turned away a woman appealing for help. 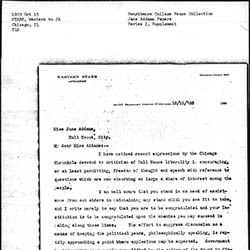 Starr offers support in the face of press criticisms that Hull-House is too liberal in its support for freedom of thought and speech.